If you've seen Jerry's other sets, you can probably skip this one. It will mostly be material you're familiar with, but less-well honed. I had to skip through much of the first part because Jerry spoke too fast for me and I have a hard time with his Scottish accent — and that's coming from someone who spent two months in Glasgow (Jerry's town) a year earlier and thought he was doing pretty well understanding the locals. Because of the "accent gap" it's hard to give the set a fair review, but if Scottish accents are no mystery to you, then I feel confident that this is a show you shouldn't miss, if only because it is utterly original, for its time anyway. 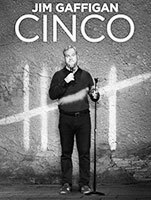 Although it's not terribly funny, this show is an interesting watch because it's the only recorded stand-up special (at least that I could find) of Roseanne Barr who, right or wrong, is an icon of American comedy. One interesting feature of the set is that at some stage Roseanne walks off the set and into a trailer, which is supposed to be where she lives with her kids and deadbeat husband. The show has a (boring) five-minute prologue in the trailer and an equally long closing section. On stage Roseanne constantly chews gum for the first three quarters of the show, when she turns to eating junk food, still delivering her lines. I'd seen stand-up comics chug beer, but performing while eating was a new one for me. It's fair to say that Roseanne has a fun, energetic demeanor all of her own. 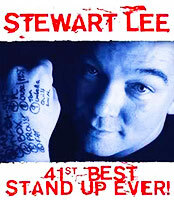 laughDB's full page for Stewart Lee: 41st Best Stand-Up Ever! During this set, George looks and sounds physically uncomfortable. He's stopped smoking, he's gained weight, and he dies four months later of a heart attack. He was only 71 years old, but I'd guess that he had already said everything he had to say. Once you've expressed your disgust for people's overwhelming lack of critical thinking, it doesn't matter that things get worse and that a bush gets chased by a trump, you have nowhere else to go. 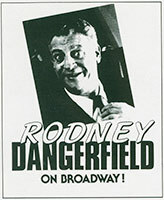 The delivery is not quite as fluid as on the previous sets, but the show is entertaining. Up to his last set, George was a funnier comedian than most of his younger colleagues. If you're a fan, you won't want to miss this set, not just as a touching goodbye to someone who'd been making people laugh since his handsome looks burned the video tape, but simply because it's good. laughDB's full page for George Carlin: It's Bad for Ya!